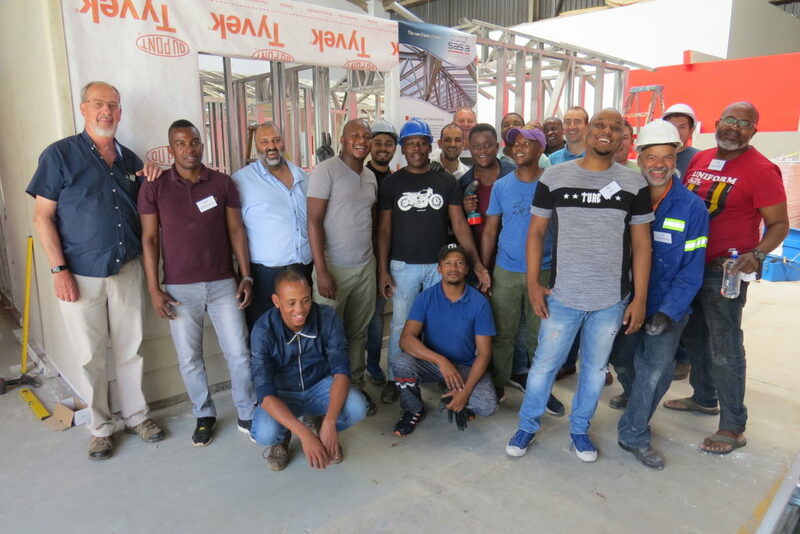 SASFA has successfully presented its 5-day training course for light steel frame building contractors – for the 28th time! 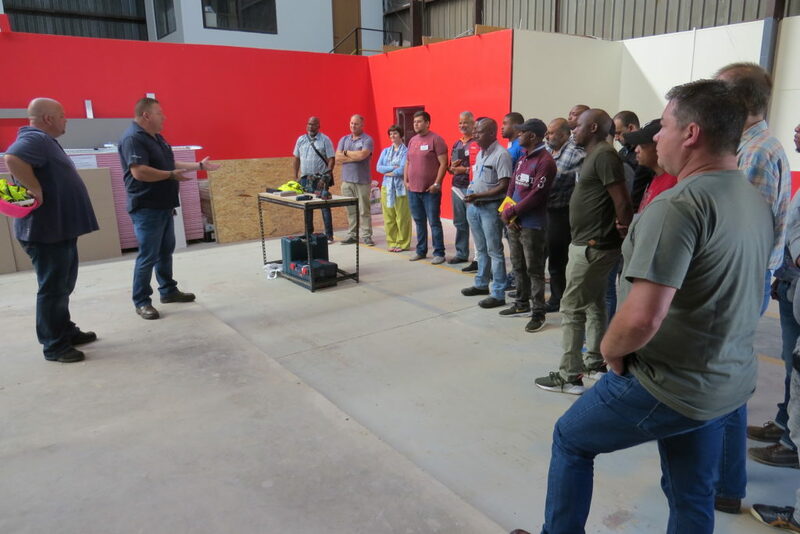 The course was presented at the training facilities of Marley Building Systems, Roodekop, Germiston during the week 25 Feb to 1 March 2019. R van Duyker and R Watson from Robert Bosch SA, illustrating the use of Bosch’s equipment. The course is growing in popularity (it was fully subscribed), as an increasing number of building contractors, developers, architects and engineers wish to become more knowledgeable about LSFB, also on a practical level. Successful completion of the course is also a pre-requisite for applying for SASFA Builder Membership. The students pictured with the LSF structure they erected as part of the practical work of the course. The course will be presented again in September 2019 in Cape Town. Internal lining, external cladding and insulation (1½ days), covering the properties, manufacturing and benefits of glasswool insulation, acoustics, energy efficiency, environmental issues, storage and handling of glasswool and tools and installation methodology. This is followed by a section on gypsum plasterboard, covering properties, storage and handling, cutting, tools and application for walls, ceilings and finishing. Finally fibre cement board for external cladding is addressed, including the installation of the vapour permeable membrane, sizes and availability of fibre cement – boards and planks, fixing accessories, installation guidelines, and door and window frame installation detail is presented. To ensure that the theoretical concepts are well understood, the course includes a practical component, consisting of setting out of wall frames, squaring, levelling, and erection of wall panels, erection of roof trusses, installation of external cladding (FC boards, OSB and FC planks), insulation and internal lining (gypsum board), and internal joint finishing. The students who enrolled for the course came from as far afield as Australia, Swaziland, Eastern and Western Cape, Limpopo and Gauteng . Most had some prior building industry experience. Current roles ranged from owners of their businesses to CEO’s, site foremen, QS’s, architects and engineers. After completion, they all rated the course highly, especially mentioning the value of the practical work. At the end of the course, the students had to write a test to assess their understanding of the subject matter. Most of the students on this course passed, and received SASFA certificates of successful completion of the course. This brings the total number of students who have successfully completed this course since its inception in 2009, to 443. The SASFA members who supplied support for the course and made it possible were Marley Building Systems, Saint-Gobain, and Marshall Hinds. Mike Hull (Hull Consulting) and Ntokozo Sibiya (Marley BS) presented the course material with John Barnard. As part of the practical work, Bosch Power Tools illustrated their wide range of equipment suitable for use in the LSFB industry.